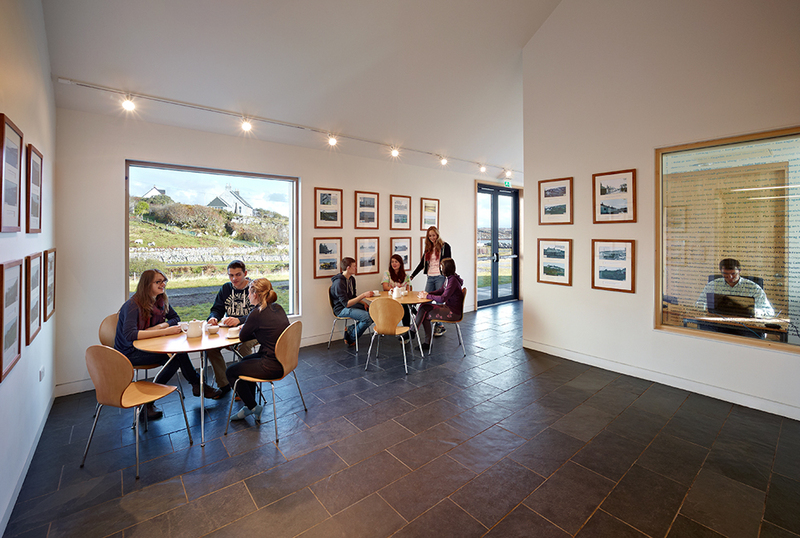 At the heart of the building is the magnificent reception desk, depicting iconic Coll views and carved by David Robinson. This forms the centrepiece of the area known as the shared space – a place for informal gatherings, somewhere to sit and work or just while the hours away, with exhibits from local artists on display. Leading off from the shared space is the bar area and the catering kitchen. Both are available to hire for functions and events and are well equipped and furnished. More peace and quiet can be found in the study room which houses a selection of books, journals and magazines on Coll and the surrounding area. Office facilities are also available at An Cridhe, with photocopying, printing and telephones on hand for a small fee. Public toilets and showers are provided in An Cridhe and there are laundry facilities at Coll Bunkhouse – all open 24 hours.